"The Monkey consists of no more than two elements. One is a wide line with a stem which, almost a mile long, leads into the maze of lines at the edge of the pampa. 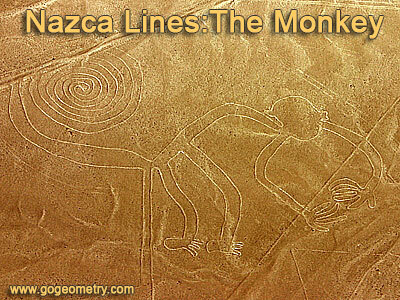 The other is one single uninterrupted line, that starts from one side of the long surface and after describing the contours of the monkey, consisting only of curves, runs through two different zig-zag shapes and crosses sixteen times over the geometric surface at whose top it finally ends." Maria Reiche, Mystery on the desert.